St. Patrick's Day is almost here, and for our area of mostly Irish descent, it's a holiday that doesn't get overlooked. As we've noted before, Saturday, March 12th is the annual St. Patrick's Day parade in downtown LaSalle. Filled with fun and festivities, it's sure to bring a huge crowd. But once the celebration begins to settle, look no further than the Uptown. We'll be offering up some Irish fare for those seeking a true St. Patty's treat! For two days only, this Saturday the 12th and again on Thursday the 17th (the actual St. Patrick's Day), we'll be dishing out the famous corned beef and cabbage plate that everyone looks forward to. 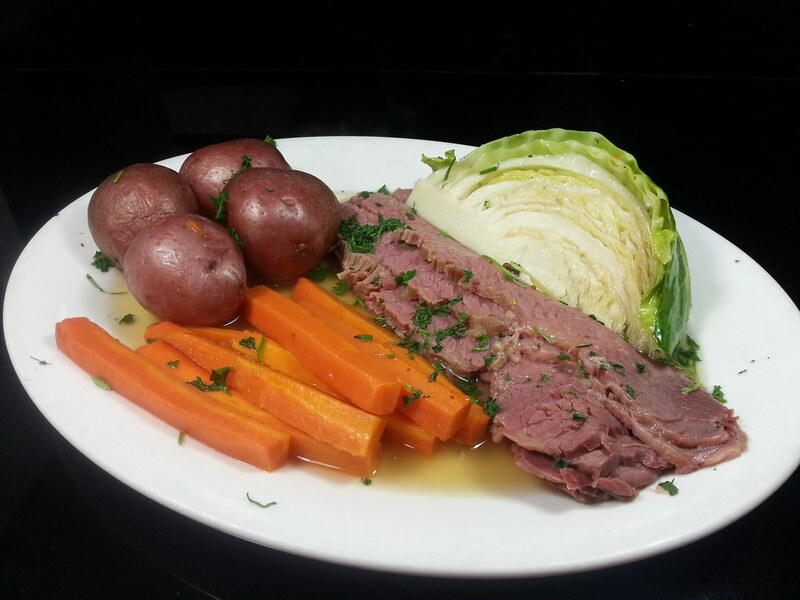 We start with a generous 8 ounce portion of housemade corned beef before it is paired with hand sliced and boiled carrots, potatoes, and of course cabbage. This isn't your everyday run of the mill dish either. You will never find any canned veggies on our plate. Everything is cut and peeled in house before it comes to you. If corned beef and cabbage is a little too much for you, we're also serving up our classic reuben sandwiches. Our corned beef is piled high with swiss cheese and housemade honey-bacon sauerkraut on fresh baked rye. With a side of thousand-island dressing, what's not to love? And to keep the mood rolling, don't forget our bar is stocked with great Irish Whiskeys, Guinness on tap, and something that a lot of people tend to forget about: Irish Coffees. During this time of year, we like to make our coffees a little more fun! We start with Jameson Irish Whiskey and mix it with freshly brewed hot coffee before we top it with a housemade cinnamon and sugar whipped cream. Our whipped cream is made fresh for every order, they'll even make it in front of you (if you're sitting at the brand new bar). Finally, it is topped with a little creme de menthe to finish it off. Much like the area residents, we don't take St. Patrick's Day lightly. Sure, it's not celebrated like any of the other major holidays, but what's to stop us from eating the traditional fare? While it's only two days, we can guarantee one of the best dishes you'll find in our area! But it won't last long, so stop in and see us before (or after) your St. Patty's celebration!